It feels like time just flies by on The Clicky Post… The reason I say that is because products I feel I just reviewed recently were write ups I did years ago. Each time a maker who’s work I reviewed previously comes out with something new for me to try, there is a little bit of nostalgia it seems when I get to look back on things done previously and how much time has passed. My favorite thing about looking back at smaller maker’s work is the progress they’ve made in their designs and as small businesses. Many of the brands we like in our little niche community are regular people like you and me, often carving out time from jobs and family to produce things we can enjoy. When you think about it, that’s pretty awesome. 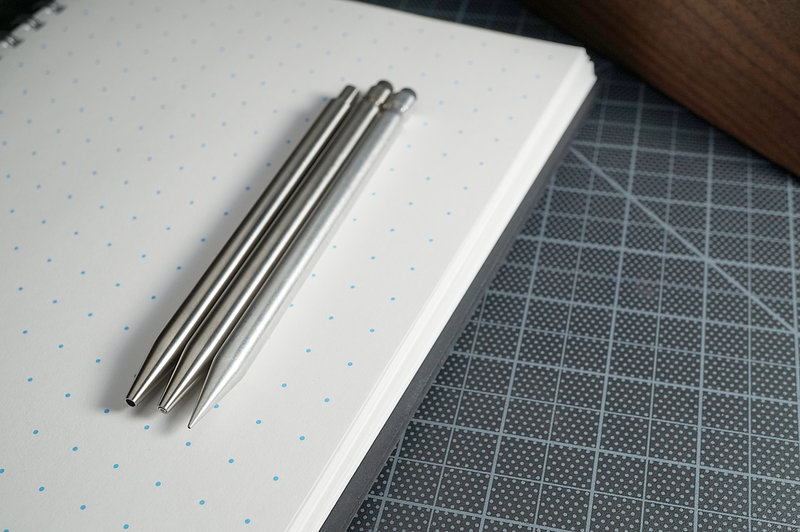 The review today is from a company/maker you may know, Andrew Sanderson of Modern Fuel (and his wife Catherine) who has produced two iterations of a sleek, minimalist mechanical pencil with much popularity. The original design was produced in 2015, and with some graciously taken feedback, a second more durable pencil (with some more intricate bells and whistles) in 2017. The most interesting aspect of the pencil 2.0 is the fact that Andrew worked to engineer the mechanism from scratch and, with first hand experience in handling it, I found it to be sort of a work of mechanical art. To make a companion for the pencil, Modern Fuel is back on Kickstarter to gain funding for a matching ink pen and Andrew kindly sent me one of the prototypes to take a look at. When I used the word “sleek” above, that has been the common theme with the Modern Fuel instruments. From a glance they are very simple, but have a uniform style and appeal that kind of draws you in. They may seem a bit cold or “surgical”, but I actually think that is why people like them. They seem very well made and intentional. The pen Andrew has produced is no different and is a nearly identical copy in shape and size as its counterpart. The variation is in the knock mechanism where the pencil has a stepped, larger cylinder shape at the top (to be big enough to hold an eraser), where the pen is just a smaller diameter cylinder which I like. There is some functionality in the pencil’s knock as well since it is where you access the hardware to swap mechanisms so it needed to be hollow. The pen wouldn’t need this feature since the only thing you need to change is the refill inside which is done via a well concealed break in the barrel. 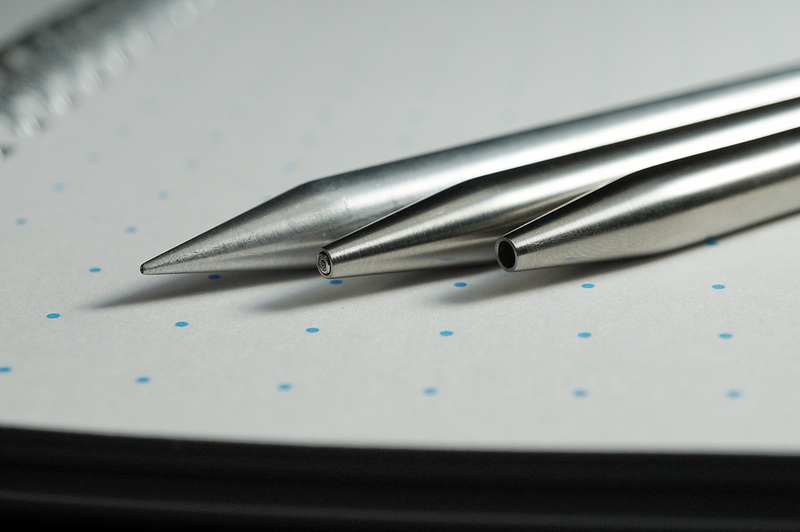 If the seam on the final production model of the pen is as good as the prototype, people are going to be very pleased… it is nearly invisible. The barrel of the pen is nicely machined without any sharp edges or obvious “imperfections”. Being a raw stainless steel barrel, it does have some marks from being used and tested, but nothing from neglect in design or execution. Compared to others, the pen may come across as a bit on the slim side being less than 3/8”, but the weight of the metal barrel balances it out nicely. Being a pretty full length clicker pen of longer than 5”, the weight of 1.5 oz (stainless steel) gives a nice heft but isn’t overbearing. As mentioned above, there is a nearly invisible break in the barrel about a quarter of the way up to allow swapping the refill. Andrew designed it to take a Parker style (international G2) which means it can also take refills like the Fisher Space Pen with the adaptor they are sold with. Also to note, the pen comes standard as clipless, but Andrew does offer one that slips over the barrel. The final aspect of the review is a bit tricky as it refers to the knock mechanism itself. The pen Andrew sent me truly is a prototype so the mechanism isn’t in its final state yet, but close. That in mind, I can’t really give it a definitive thumbs up or down, but it is designed to be a quiet "click” similar to that of the Schmidt mechanism found on a lot of maker’s pens. But, rather than an off the shelf part Andrew is again setting out to manufacture his own. In my opinion it fits the pen really well in style, length, and tension. Nothing really beats a satisfying “CLICK”, but I think this will suit people fine and with any kinks ironed out it will be great. 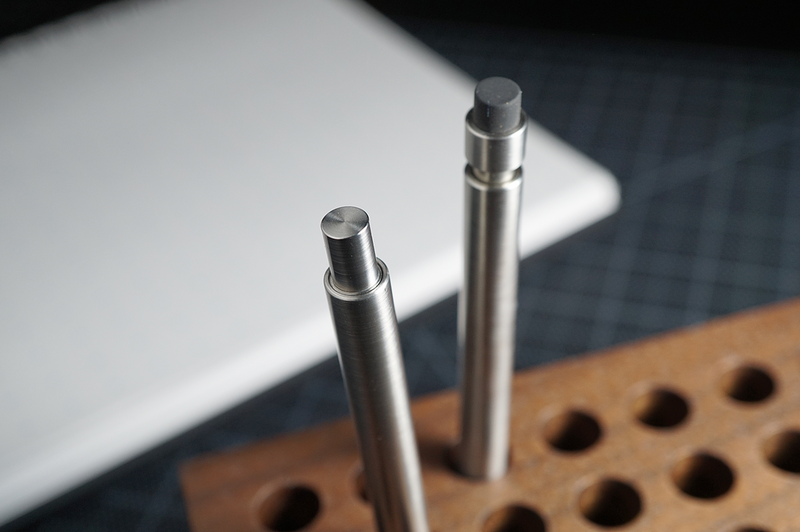 Being a more bespoke and small batch type of maker (and with custom mechanisms), the Modern Fuel pen is a bit on the higher price scale starting at $120 and going up from there for titanium. I’m not sure if the prices on Kickstarter are greatly reduced in comparison to to ultimate retail. The pen is beautifully made, and a range of $80 - 150 seems about a sweet spot for it as this is what the competition for pens in this category tend to fetch. Special thanks to Modern Fuel for sending this by to take a look at and I’m excited to see how the final product rolls out. For more details, definitely check out the Kickstarter campaign which is ending in the next couple of weeks.